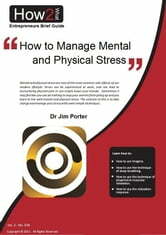 Entrepreneurs Brief Guide - Mental and physical stress are two of the most common side effects of our modern lifestyle. Stress can be experienced at work, and can lead to excruciating physical pain or can simply lower your morale. Sometimes it may feel like you can do nothing to stop your worries from piling up and you learn to live with mental and physical stress. The solution to this is to take charge and manage your stress with some simple techniques. In 30 minutes, learn how to: (a) use imagery, (b) use the technique of deep breathing, (c) use the technique of progressive muscular relaxation and (d) use the relaxation response. I See Stupid People: And They Are Getting On My Last Nerve!